Based on research notes from Brian Stucky’s Alta Mill research. 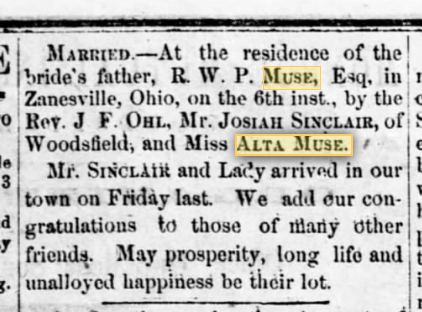 “Alta was named in memory of the deceased daughter of the writer, Alta O. Muse.” — Judge R.W.P. Muse, History of Harvey County: 1871-1881. Historical Atlas of Harvey County – Alta Township indicated. In his 1881 History of Harvey County Judge Muse, noted in the section on naming cities and townships: “Alta was named in memory of the deceased daughter of the writer, Alta O. Muse.” Alta Muse was something of a mystery to Harvey County historians. She does not show up on Harvey County census, nor was she buried in a Harvey County cemetery . . . until recently. Brian Stucky was able to connect the name with story of Alta Muse. While researching the Alta Mill located in the Alta township in Harvey County, Stucky stumbled on a clue that led to a sad story. Stucky noted: “I always thought for some reason that Alta was a young daughter, maybe 9 years old, but I don’t know where I got that. No, she was older, age 23, and she was married to a Josiah Sinclair for almost 2 years. So, we’re looking for someone named Alta Sinclair.” Newpapers had been added to the site Newspapers.com and out of curiosity, he included a search on Alta Muse. Alta Olivia Muse was born in McConnelsville August 17, 1847 to Judge RWP and Julia Hurd Muse. She would be one of four daughters born to the couple. In 1852, Judge Muse moved his family to Zanesville, OH. On August 24, 1860, Alta’s older sister, Ada, died at the age of 19. For her obituary a former high school principal praised her scholarship and character. She married married Josiah Sinclair “at the residence of the bride’s father, R.W.P. Muse” on April 6, 1869. Following the ceremony, the newlyweds lived in Pittsburgh. Marriage Announcement, Spirit of Democracy. Woodsfield, OH, 27 April 1869. 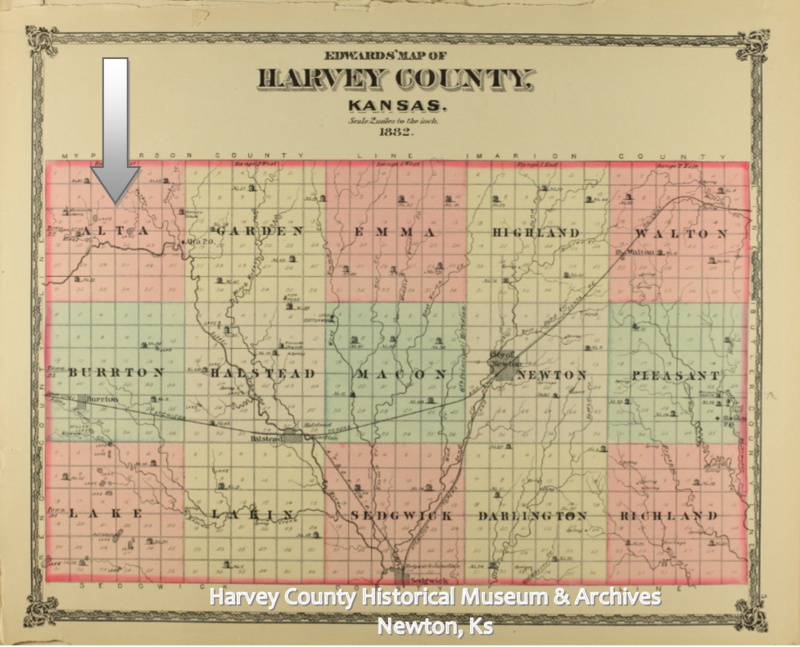 Shortly after her death in February, Judge Muse was traveling in Kansas to the new town of Newton. “The first passenger train crossed the new bridge over the Cottonwood (river) and entered Florence on May 8th, 1871. This was then the terminus of the railroad. The writer was on that train, en route for Newton, for the purpose of there erecting an office to be ready to put the railroad lands upon the market, as soon as the railroad reached that point, and was accepted by the governor. Alta’s husband, Josiah Sinclair, according to information on Find-a-Grave, went back Wheeling, West Virginia. He married again in 1874 and served 7 terms in the West Virginia legislature. Sinclair died in 1914. Thank you to Brian Stucky for sharing his research notes on Alta Muse Sinclair. Bowman, Mrs. C.S. “Organization of Harvey County” typed manuscript, October 7, 1907, HCHM Archives, Newton, Ks. Muse, Judge RWP. 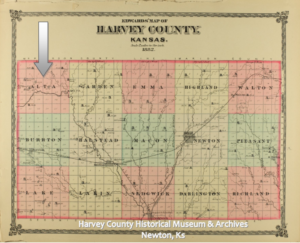 History of Harvey County: 1871-1881. “Judge Muse Dead” Newton Daily Republican, 23 November 1896. “Alta O. Muse Sinclair Obituary” Spirit of Democracy 28 February 1871, Zanesville Courier. 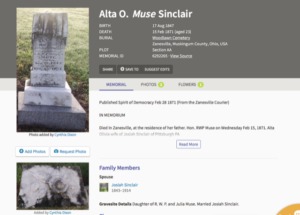 Find-A-Grave, “Alta O. Muse Sinclair” Memorial Number 6292265. Find-A-Grave, “Josiah Sinclair” Memorial Number 187771766. Find-A-Grave, “Ada Burke Muse” Memorial Number 6292263.